My mother, Miriam Glochowsky Shukert, was born in 1913 in a tiny village in the Ukraine, pronounced, "Zvenigarotka". This is a phonetic spelling of a community so small it isn't even on the map. She was the youngest of eight children born to Harry and Goldie Glochowsky. The family was originally aristocratic and well-to-do, receiving immunity from Czarist oppression of Jews in exchange for my grandfather's background in military strategics. In actuality, his loyalties were with counter-revolutionists, planning to overthrow Czar Nicolai, so the story goes. I can't attest to its authenticity, as there is no formal documentation, only folklore. But knowing the integrity of this family, I can only suspect that if duplicity was required of my maternal grandfather, it must certainly have gone against his principles. However, in those turbulent times, people did whatever was necessary for survival. The Glochowskys were eventually driven out by the Bolsheviks, all their worldly possessions stolen or destroyed, and they were relegated to living in poverty under the constant threat of the pogroms. The scenario was quite similar to that of "Fiddler on the Roof", where occupants of Anetevka were forced to flee their homes. My mother's father and brothers obtained a visa to the United States, one brother emigrated to Cuba, and my father and another brother settled in Omaha. My maternal grandfather established a small grocery store next to the house in which he lived, on 31st and "R" Street. 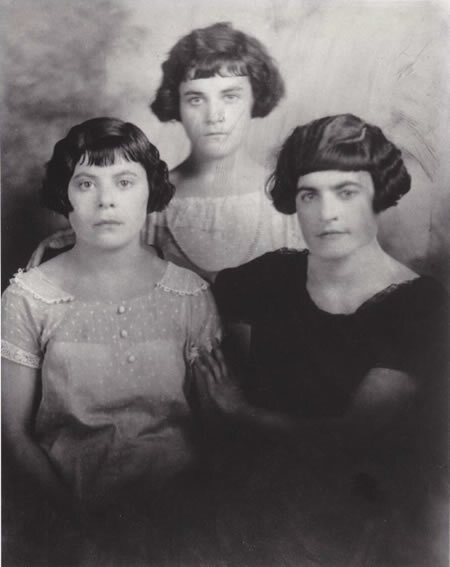 Meanwhile, my grandmother and her three daughters, Bertha, Mollie and Miriam, escaped from their village in a horse-drawn cart, first to Bremen, Germany, and then to Southhampton, England, and from there, sailed the Atlantic in steerage, to join the family in Omaha. Mother spent her first few days in this country on Ellis Island, undergoing clearance procedures. My mother was ten years old when she came here, and spoke only Russian and Yiddish. She started kindergarten at that age, quickly learned English, and eventually graduated from the eighth grade. She became a naturalized citizen through her father. Although she had a limited education, she was very bright and intuitive. Her friends helped her become more Americanized, and she was known as "Mary" from then on. She worked in the office at Paxton and Gallagher prior to marrying my father. My earliest recollection of my mother was her beautiful soprano voice. She serenaded me when I was a small child. She sang while doing housework, often accompanying the radio. In the days when milk was delivered to the back porch, one morning the milkman happened to overhear mother's rendition of "God Bless America". He stood entranced for several minutes outside the screen door, until mom looked up and saw him. Flustered, she stopped on a high note. "That was very nice," the milkman said. "Kate Smith herself could never have sung that song as well. Do continue." But mom, not one to seek an audience, was too self-conscious to finish. Because of mother's love of vocal music, my brother and I grew up in a contagiously tuneful environment. Before we knew it, we were singing along with her. If she didn't know all the lyrics, she would make them up, or simply hum. Those were happy times. My mom's other great love was cooking. She could turn a simple meal into a gourmet feast. Nobody could make chicken soup, apple pie or chocolate-chip cookies like my mother. She specialized in Jewish dishes like borscht, kugel, kreplach, chopped liver, gefilte fish, and potato latkes. She never followed a recipe, but had a "feel" for measurements and ingredients. Often times she would make up her own dishes, so popular among her family and friends, they became her trademarks. Friends would actually invite themselves to dinner. Mother was a petite lady with fair skin, blue eyes and fine features. Her hair, originally brunette, gradually turned to silvery-white. Her personality was generally upbeat, but she was outspoken, and at times, feisty. There were occasions when I felt she could see right through me. She was a no-nonsense type, and you didn't dare try any shenanigans. My mother's life for the most part, was beset by tragedies. She had lost all her siblings, her parents and my father by the time I was grown, and she suffered a number of health problems in later life. After my father died, mom worked at Goldstein-Chapman's downtown. She liked to get together with friends, bowl and play bingo. She did yard work and maintenance around the apartment building my parents owned, and carried sacks of groceries home from a neighborhood store several blocks away, as she never learned to drive. Mom lived to be 84, and I consider myself fortunate to have had her that long. Ten years have passed since she died, and still I catch myself going to the phone to share important news with her. It's difficult to forget the person who has known me the longest -- even before I was born. I always loved my mother, but I can't remember actually telling her in so many words. It would have made her happy. Even though it's too late to speak to her in person, I like to think that somehow she knows. On holidays, especially on Mother's Day, I miss her the most.